Thank you to Janet Mata for this research. 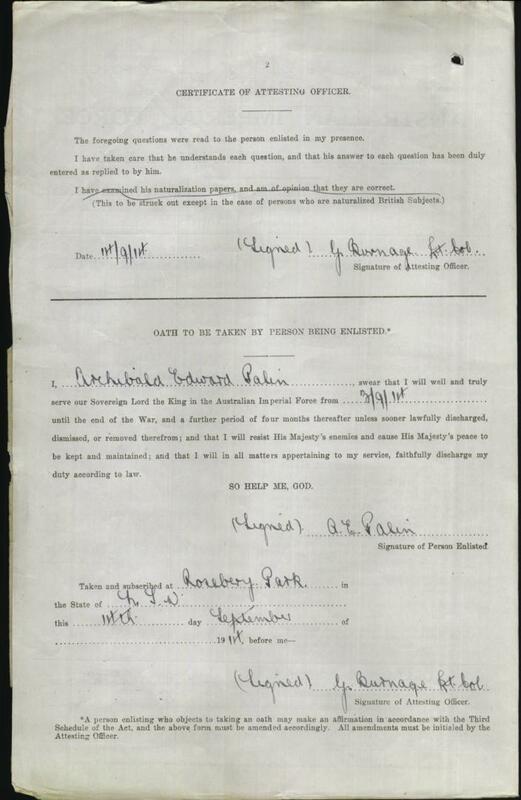 Archibald Palin was born in Dorking on 6 January 1892 and, according to his military records, was fostered from birth by George and Ann Charman. He attended St Martins C of E Infants School and then St Martins C of E Boys School. During these early years of Archibald’s life, the family were living in Meadowbrook Road, Dorking. By 1901 the family, which included infant Albert Charman, had moved to Mickleham where George Charman was a “Carter” on the “Burford” estate. 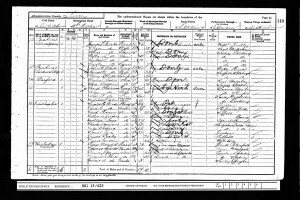 The census return of that year records Archibald as the Charmans’ “Adopted Son”. By 1911 the family had moved to 10 Dene Street Gardens in Dorking and George was working as a “Contractors Carman”. 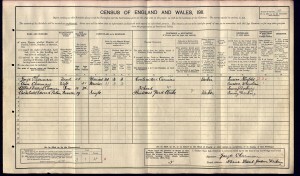 Interestingly, Archibald, now 19, is listed as a “Boarder” with the family rather than Son or Adopted Son. He was working as a builder’s yard clerk. 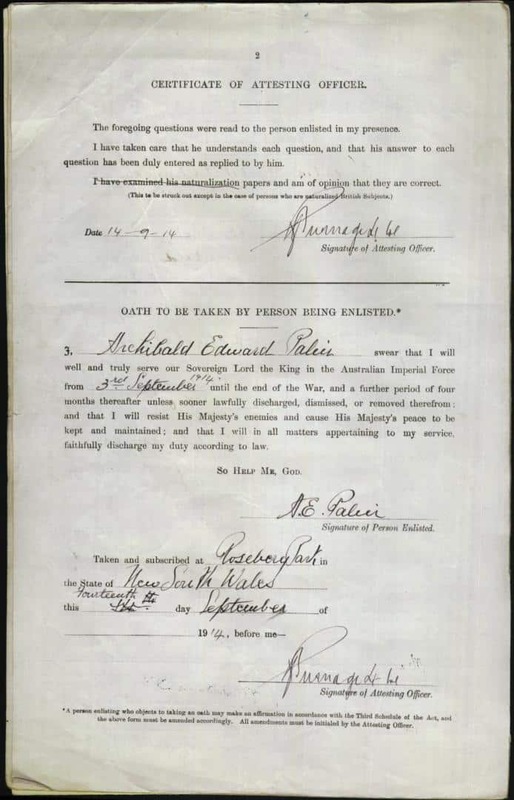 Archibald went to Australia when he was 21 years old – presumably by himself as his parents continued to live in Surrey. 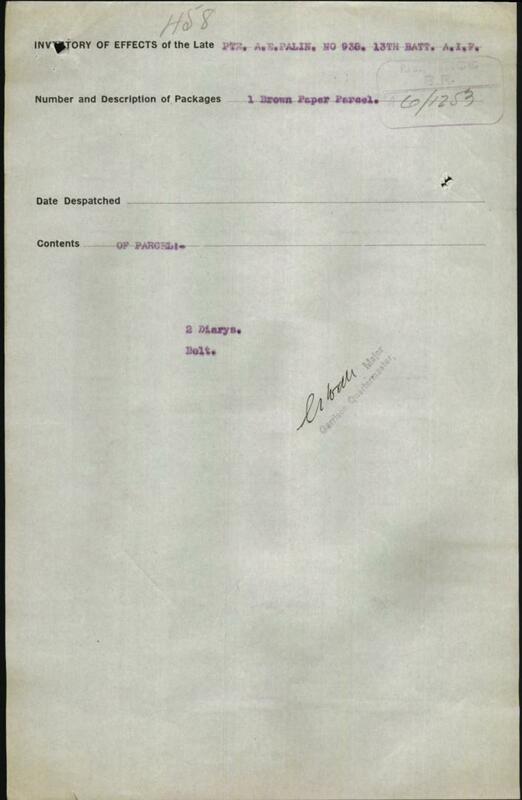 His name hasn’t been found on the passenger lists. He found work as a railway fireman in New South Wales, living in Ben Lomond, NSW. 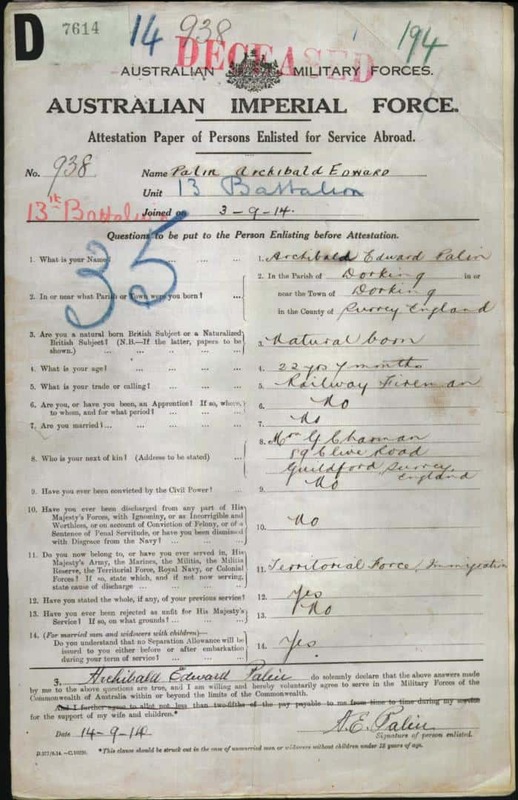 He was only 22 and still newly arrived in Australia when he volunteered at the outbreak of War, enlisting on 3 September 1914 at Roseberry Park, NSW. 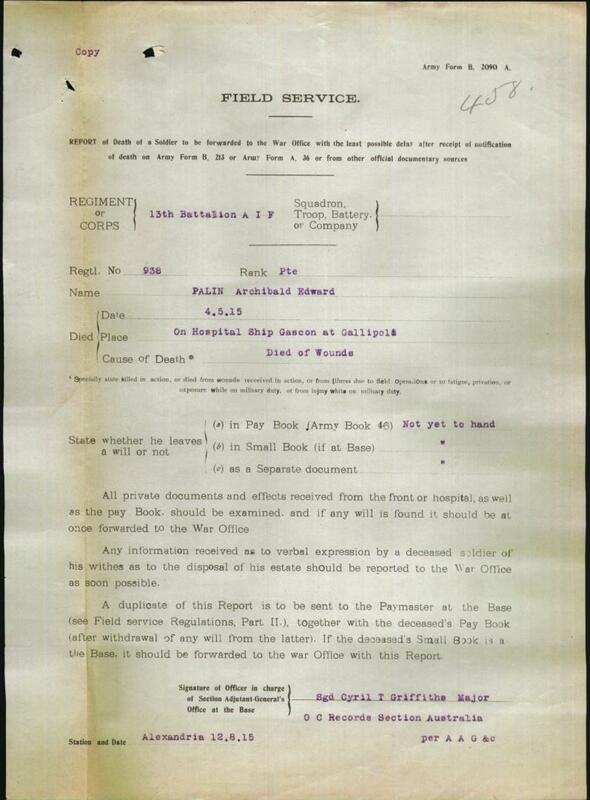 His adoptive mother, Mrs Charman, is listed as his next of kin, but now living at 89 Cline Road, Guildford. 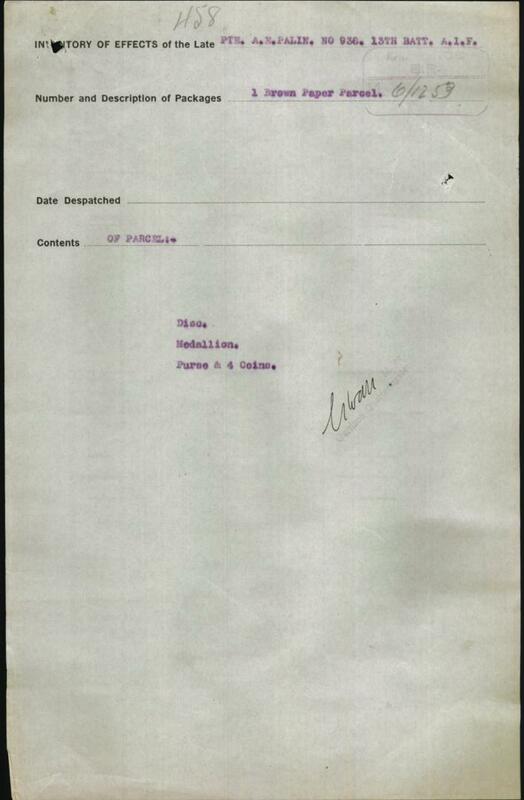 Archibald Palin was assigned to the machine gun section and embarked on HMAT Ulysses at Melbourne on 22 December 1914, making for Gallipoli. 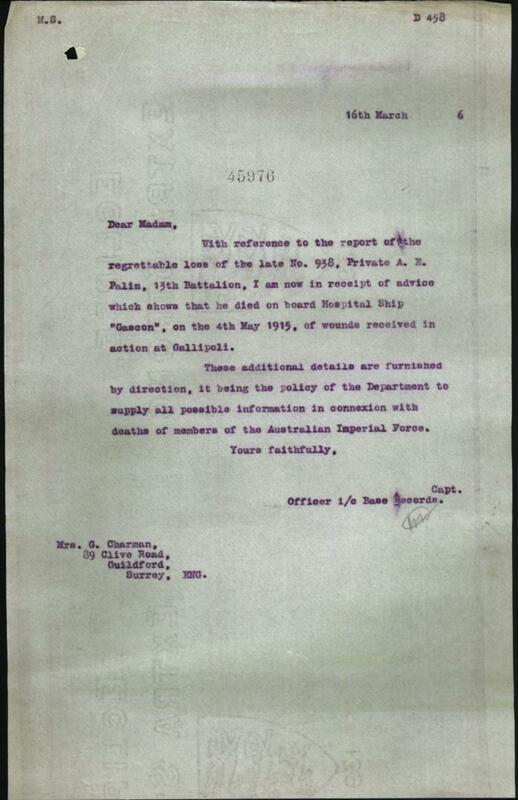 Much of his official paperwork is held in Australian military archives. 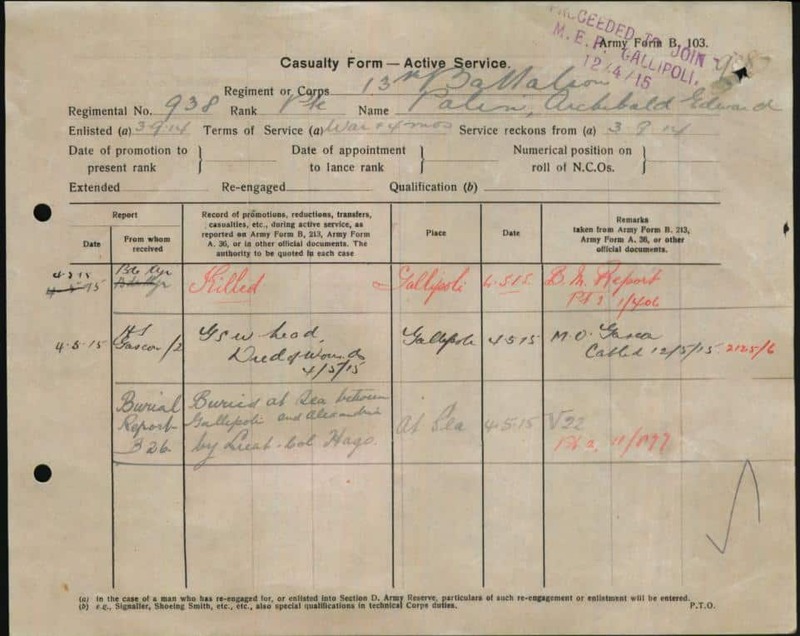 From this we know that Archibald was 5ft 6 ins high, had a fair complexion, blue eyes and auburn hair, and that he weighed 10 stone at enlistment. 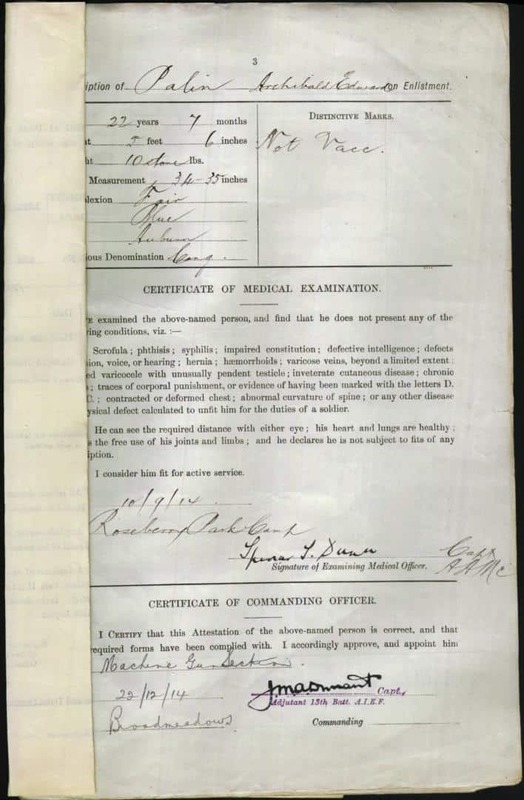 His pay was 5 shillings a day. 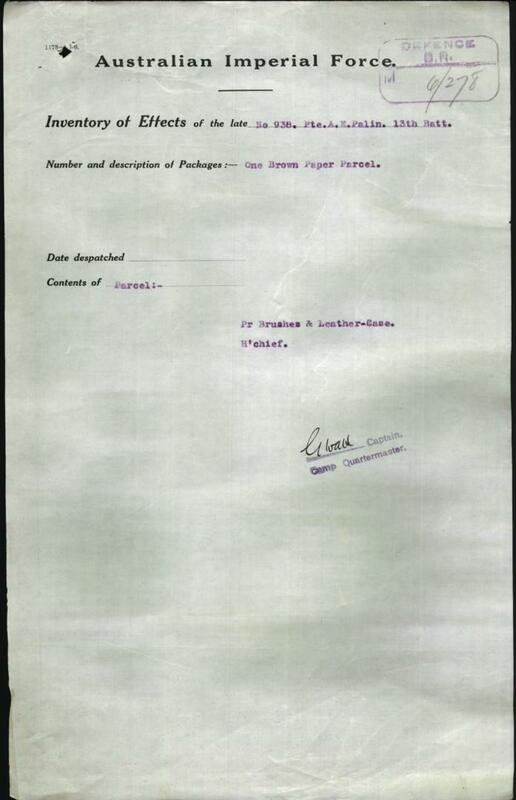 A. E. Palin Attestation Papers © NAA: B2455, PALIN A. E.
A. E. Palin Admin of Estate © NAA: B2455, PALIN A. E.
A. E. Palin A.E.P. 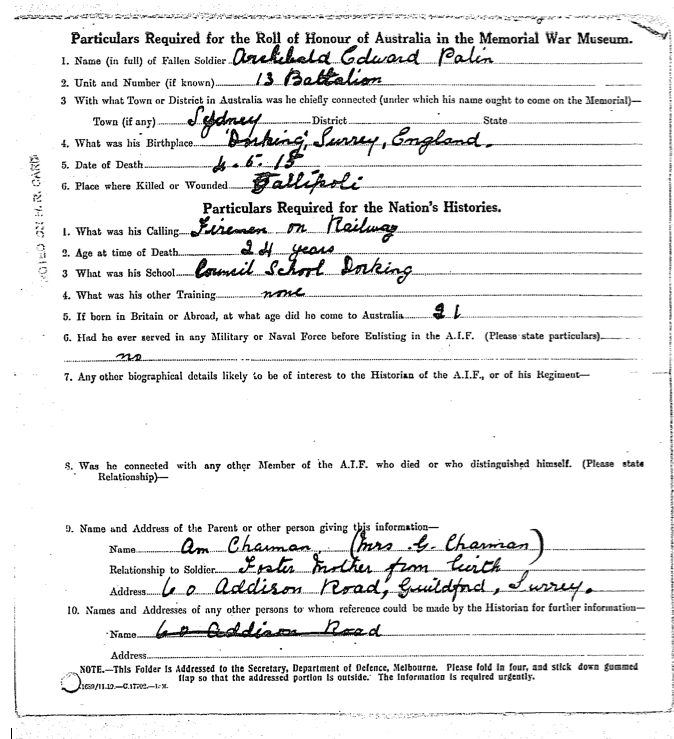 Oath © NAA: B2455, PALIN A. E.
A. E. Palin Casualty Form © NAA: B2455, PALIN A. E.
A. E. Palin Field Service Record © NAA: B2455, PALIN A. E.
A. E. Palin Inventory of Effects © NAA: B2455, PALIN A. E.
A. E Palin Inventory of Effects © NAA: B2455, PALIN A. E.
A. E. Palin Letter to Mrs. Charman © NAA: B2455, PALIN A. E.
A. E. Palin Medical Certificate © NAA: B2455, PALIN A. E.
A. E. Palin Report of Death © NAA: B2455, PALIN A. E.
A.E. 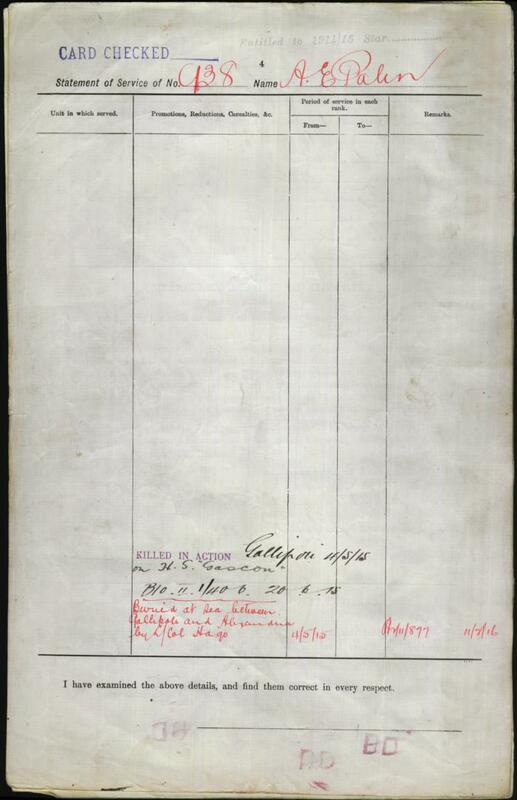 Palin – Report of Burial © NAA: B2455, PALIN A. E.
A.E. 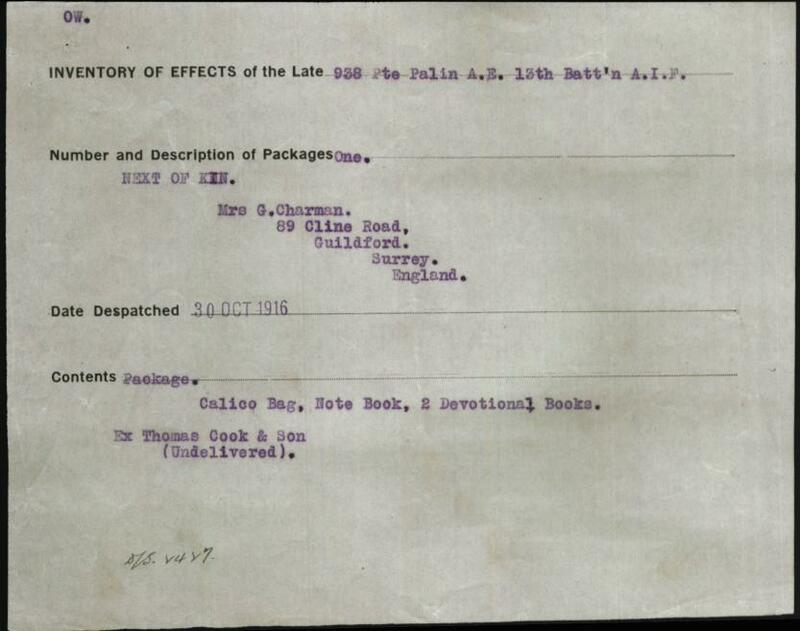 Palin – Roll of Honour © NAA: B2455, PALIN A. E.
Archibald Palin was involved in the early days of the Gallipoli campaign but was killed in action soon after his arrival in the Dardanelles. 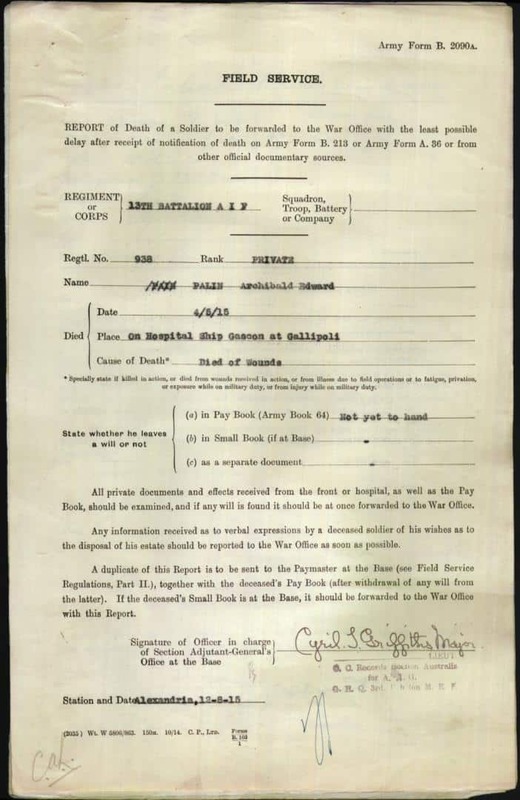 He died of wounds, apparently a gunshot wound to the head, aboard the hospital ship Gascon and was buried at sea between Gallipoli and Alexandria. 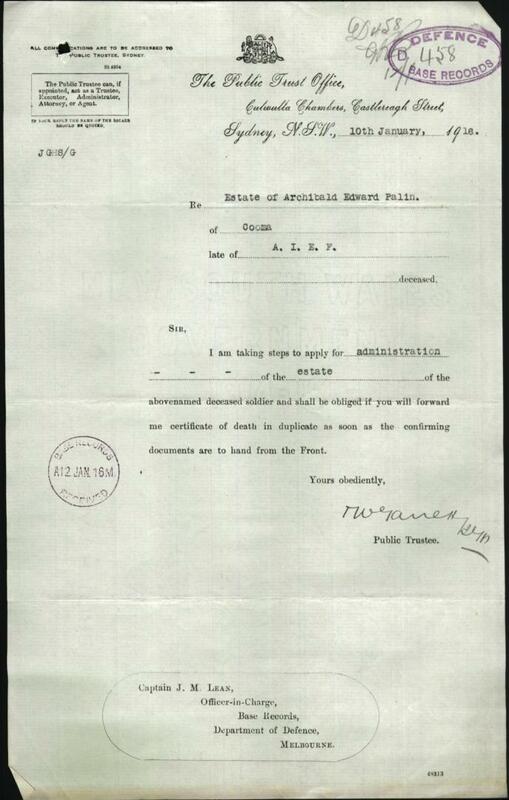 Mrs Charman had to wait for the best part of year to find out how her son died: she received a letter dated 6 March 1916 with details.